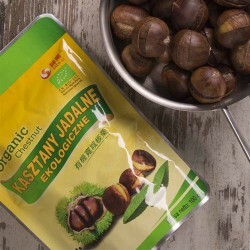 Organic Chestnuts 100g - Solida Food Sp. z o.o. Organic Chestnuts. The product is steamed, ready to eat. 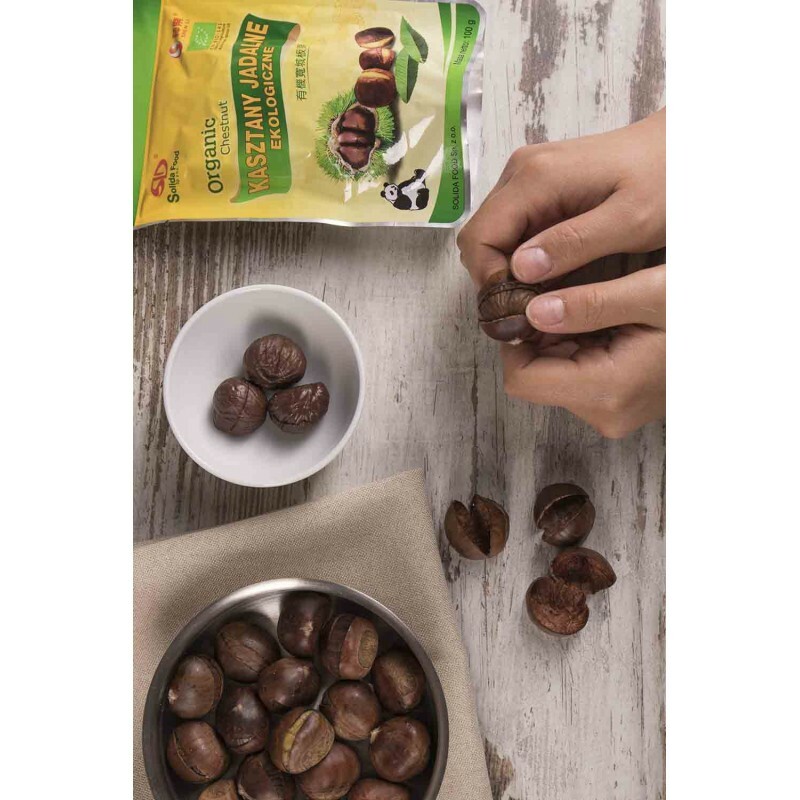 Organic chestnuts are a healthy alternative to snacks and a tasty ingredient. They have a lot of nutrients. They work on the pancreas, liver and spleen, and also affect the immunity of the body. They do not contain gluten. Ready-to-eat product. Click to see the recipe for chestnut cake without baking! Chestnuts have many nutritional values. Include sucrose, malic acid, citric acid, magnesium, iron and lecithin. There are significant amounts of B vitamins that strengthen the nerves and the immune system, vitamin E, which slows the aging process and reduces the potassium. There is also a lack of healthy fat, as many as 2/3 of fat is unsaturated fats, indicated for the treatment of heart disease and cardiovascular disease. St. Hildegard recommended chestnuts for pancreatic, liver and spleen disorders. The suggestion of serve according to St. Hildegarde: crush the pulp of chestnuts, put into honey (3 tablespoons chestnuts per 100 g of honey), then mix. Chestnuts also work on headaches, memory problems and concentration. They affect the body's resistance and counteract infections. Moreover, they have a lot of starch, which in the heat treatment turns into complex sugar (slowly absorbed by the body). They also contain dietary fiber, which makes them a filling product. Dieters recommend eating chestnuts during periods of stress and fatigue. Chestnuts are easy to digest, so you can eat them in virtually any age. They contain a lot of potassium, which is why they are recommended to sportsmen. 100 g of chestnuts supplies as much vitamin C as 100 g of lemon. Chestnuts are completely devoid of gluten and can be eaten by celiacs. Chestnuts are also used in medicine because they contain an escina that has the properties of sealing the walls of the blood vessels and reducing edema. Chestnuts are steam cooked so they are ready to eat when opened. They can be eaten cold as a snack, warmed up after cooking in an oven, frying pan or in a microwave, as well as used as a food ingredient, i.e. for soups, pasta or desserts. The popular use of chestnuts is to grind them into chestnut flour.